...okay the title is a little bit more dramatic than need be, but i've got a real gripe with the floral industry on this one. 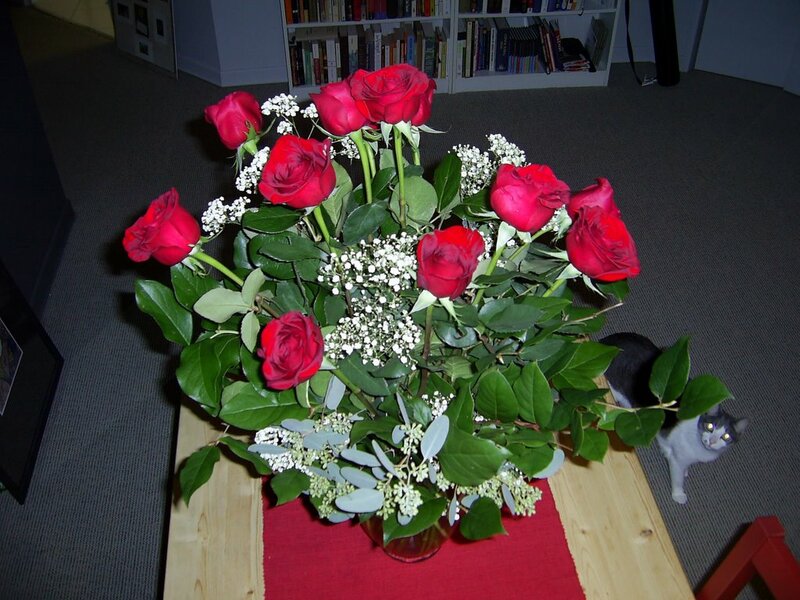 this past v-day both my roommate and i received gorgeous floral bouquets from our bf's...george. they were delivered to our places of work and sat under clear cellophane and ribbons waiting to be unwrapped. the cutest part about the floral delivery has to be the tiny, precious little muffin cards that come with them. mine was wrapped in a gorgeous wee creamy envelope, todie's in crisp white. 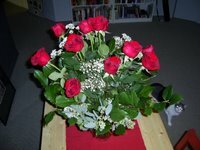 now, i must admit that it must be a source of great stress for the new bf to decide what goes on the v-day flower card. particularly when words like "love" are so loaded at such a precarious time of the relationship. and some bf's must find the act of communicating to the florist what they should write on the card somewhat mortifying...i mean you can't exactly say "love and kisses on all your pink parts" while a queue forms behind you. i'm only sayin'. but let me get to the point. and that is this, two bf's went to a florist, ordered george bouquets and communicate the appropriate message to be delivered with said bouquets. now it seems that a twisted game of "telephone" was played between the verbal instructions and the writing of the cards. neither card had the same message. in FACT, both cards had additional words that made the message more "lovey" if you will. hearts were drawn, declarations were made, gf's were freaked out. what is this sick and twisted game you play florists? are you trying to play a blind game of cupid? or should it be assumed that all that queen anne's lace and baby's breath has affected your auditory and cognitive functioning? shame on you florists. shame on you.